Recently, paging happily through “The New Yorker Album of Art & Artists,”* I stopped to enjoy the classic Tobey cartoon after “The Sleeping Gypsy” by Henri Rousseau, c. 1897. I’d admired this many times before, but never bothered to notice the painting on the wall to the left. 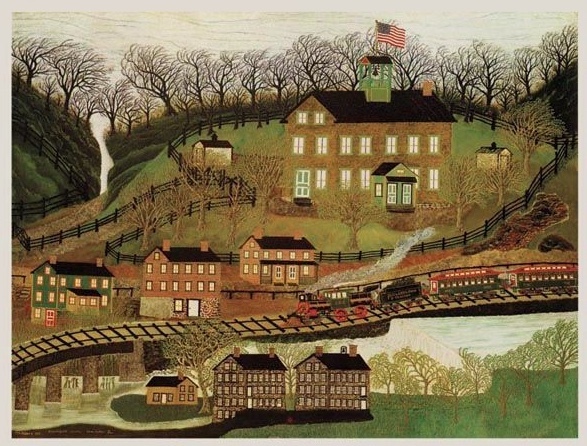 It is “Manchester Valley” by Joseph Pickett (1849-1918). When discussing avant-garde art, the name of Joseph Pickett is not on every lip. 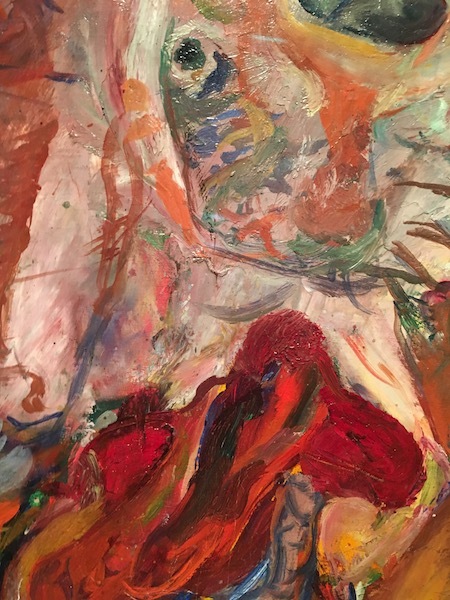 But “Manchester Valley” is, in fact, in the collection of the Museum of Modern Art, and hung in the museum’s 25th Anniversary Exhibition in 1954-55. It was on Floor 1: “CEZANNE THROUGH THE EARLY 20TH CENTURY”: Cezanne and his contemporaries; Seurat, Van Gogh, Gauguin; Ensor, Redon; Rousseau; Bonnard, Rouault; Prendergast; Matisse; The lesser “fauves”; Modigliani; Expressionism in Central Europe. And Pickett. Who seems like odd company for those luminaries. The fact that it was a gift of Abby Aldrich Rockefeller, a founder of MOMA, and wife of moneybags John D. Rockefeller, Jr., may have had something to do with its inclusion. In any case, there it was. My parents saw that show, and picking through the competition, walked out with a reproduction of “Manchester Valley.” Which in the fullness of time came to me, and now, a bit darkened with age, still hangs in my house. An odd piece, but full of satisfactions. It holds up after all these years. Thus my interest, and how I can’t imagine how for so long I failed to notice it in the Toby. *Published 1970. Heartily recommended. 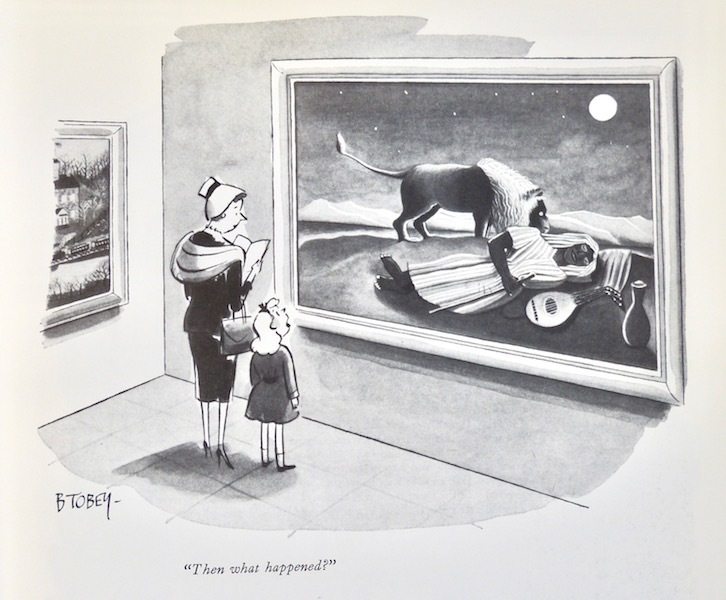 Pieces from The New Yorker’s great old cartoon days, riffing on art and art fashions from the ’40s through the ’60s. Available at abebooks.com for $4.64, the last time I looked. 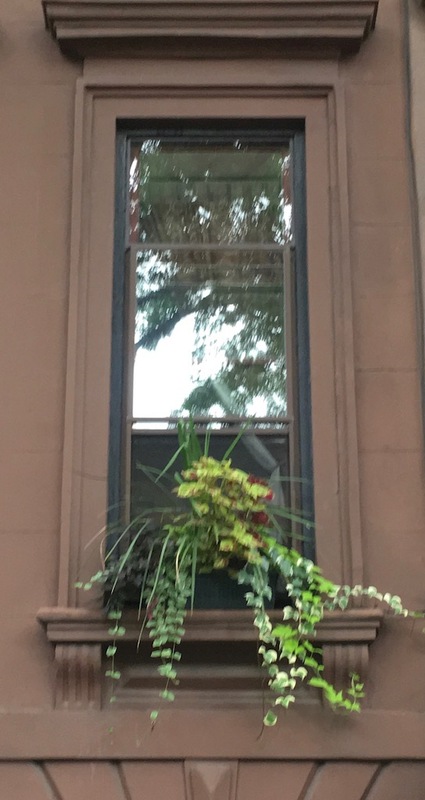 You find these and many similar windows along Carlton Ave in Brooklyn. Informal art of an unassuming, delightful kind: people putting out little plantations and looking after them. 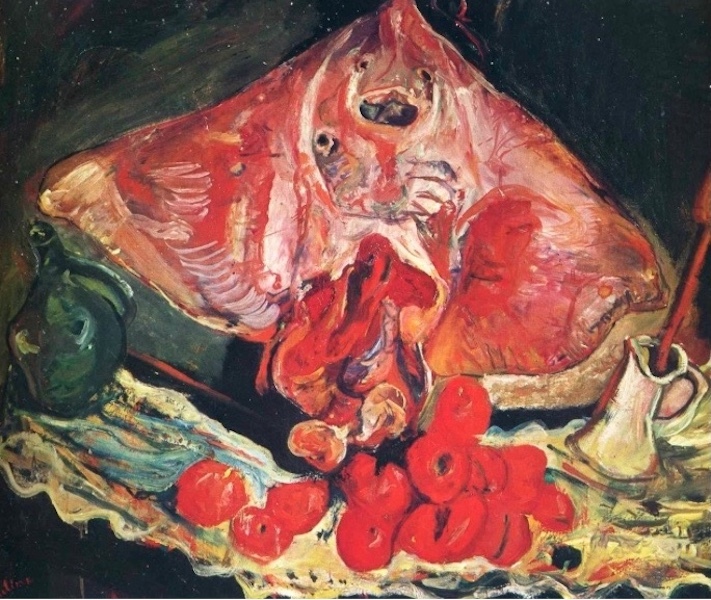 The show of Chaim Soutine (1893–1943) now at the Jewish Museum in New York is full of delights—some pretty standard images in all the art history texts, but other, lesser-known surprises. 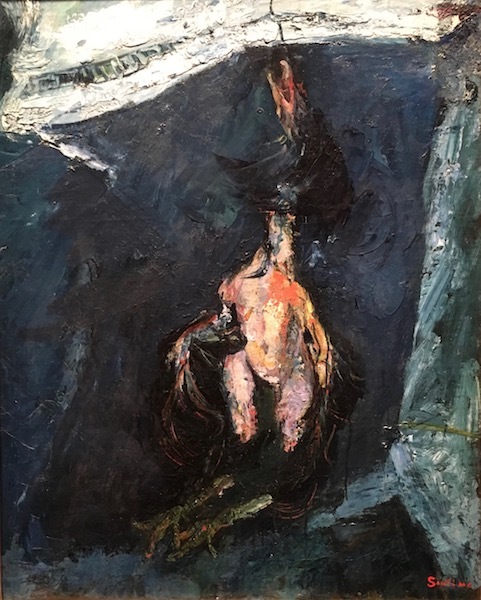 And one of the nifty things about this show is that very few of the pieces are under glass, so you can really eyeball the surfaces–sometimes to Soutine’s advantage, but not always. He gets messy. 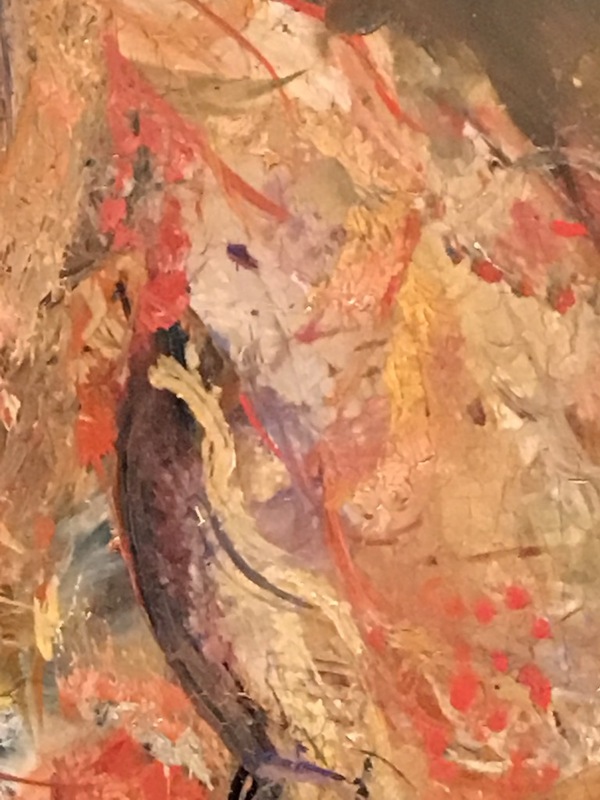 The closer you look, the more fascinating is the loose, splashy handling—color and brushwork wonderfully expressive but having little, if anything, to do with physical description. Then the odd “Hanging Turkey” c.1925. with its human female torso. And “Turkey” c. 1925. The turkey almost gets lost because the dark neck against the dark surround separates the head from the body, the leg shapes and color are repeated along the side, and there’s that odd mechanical piece coming in from the corner. 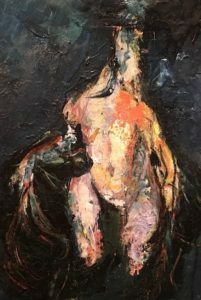 But once you’re hooked in, you come closer and closer, fascinated with how Soutine dances between representation and abstraction. 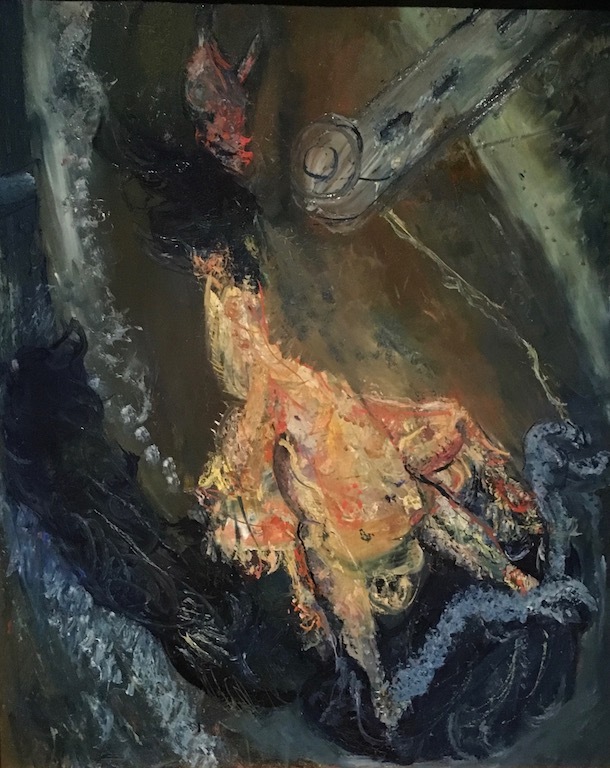 Theophilus Brown (1919 – 2012) was a member of the Bay Area Figurative Movement of the ‘50s and ‘60s, and continued drawing and painting into the new century. 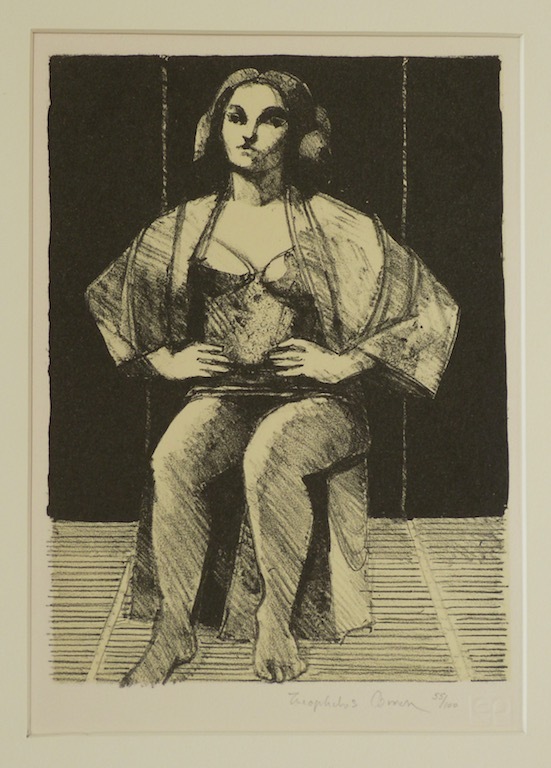 This undated lithograph ( 8½ x 6” ) lives happily on my dining room wall. I admire the strong, sharp design – those sleeves, those two improbable but perfect light lines coming down the wall, and then the horizontally delineated floor panels. The rich dark shadows here and there that press foreground and background into one plane. The figure modeled in unabashedly direct, diagonal strokes. 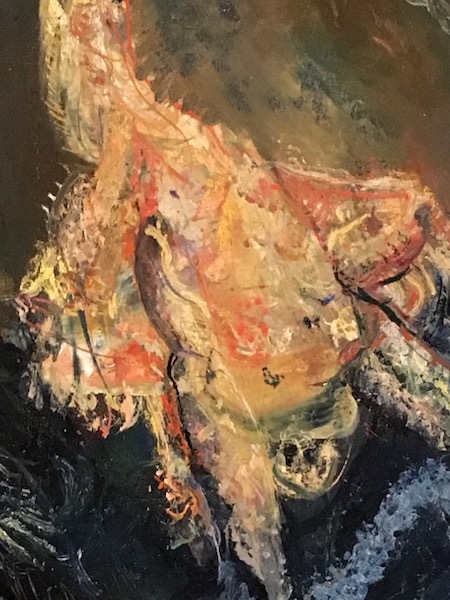 Bit by bit and all at once the piece hits that exciting balance between image and abstraction that those Figurative fellas understood so well.